This show marks the start of Gregory Doran’s six-year plan to present the entire Shakespeare canon. It’s fair to say that his own beautifully crafted, richly detailed production sets a high standard for himself and others to aim at. David Tennant, in a mesmerising performance that grows in power as Richard’s authority declines, also reminds us that the Royal Shakespeare Company is a ensemble that paradoxically needs stars. It’s a sign of Doran’s care that he makes clear the complex back-story that illuminates Shakespeare’s play. An audience needs to know that Richard’s original sin lies in sanctioning the murder of his uncle, the Duke of Gloucester. Michael Boys began his 2007 production by having Richard stepping lightly over the corpse of the dead duke. Doran, even before Richard’s entry, shows us elaborate funeral rites with three sopranos singing religious anthems in the upper galleries and the Duchess of Gloucester bent in grief over her husband’s tomb. This is clearly a court steeped in mourning. The prelude also gives Tennant a vital context in which to work. His Richard, with his brocade gown and Christ-like hair, initially affects an air of listless boredom as his burly barons hurl accusations of treason at each other. But there’s a thrilling moment when Tennant gives the banished Mowbray a piercing stare as if daring him to spill the beans about the king’s part in Gloucester’s murder. Tennant combines inner guilt with a careless disregard for realpolitik as he seizes the land and goods of John of Gaunt after his death: a point reinforced here by the fact that we see tuns of treasure being bodily transported. Tennant’s strengths, as we know from his Hamlet, are a capacity for quicksilver thought and an almost boyish vulnerability. And, even if he might do more to convey the patterned lyricism of the language, which he brings out excellently is the fact that Richard only learns to value kingship after he has lost it. In his decline, Tennant casually tosses the crown away and, at one point, skittishly places it on the head of his adored Aumerle. But in the Westminster deposition scene, where Tennant is at his best, he challenges Bolingbroke to “seize the crown” and, when his rival rises to the bait, immediately inverts it to suggest a falling bucket. Tennant’s great achievement is to attract out sympathy to what the gardener calls a “wasteful king” who abuses power when he has it and who achieves tragic dignity only in his downfall. But this production, which combines period costumes with back-projections in Stephen Brimson Lewis’s elegant design, is emphatically no one-man show. Nigel Lindsay’s Bolingbroke is a palpable dangerous figure who treats Richard’s remission of his initial banishment with surly disdain and openly scorns the deposed king’s self-conscious theatricality. It is also good to see a number of RSC veterans operating at top form in key roles. Oliver Ford Davies is brilliant as the Duke of York in that he highlights both the comedy and pathos of a man torn between ancestral loyalty to the crown and a recognition of Bolingbroke’s power. Michael Pennington’s John of Gaunt is also a fine study of a dying man bursting with intemperate rage at Richard’s betrayal of his country. And Jane Lapotaire turns the Duchess of Gloucester into a silver-haired figure whose widowed grief manifests itself in a burning appetite for revenge. The packed houses for this production’s run in both Stratford and at the Barbican may have much to do with Tennant’s star presence. But this is the strongest company the RSC has fielded in years, and what Doran’s production brings out is the rich complexity of a play that raises the eternal question of at what point it becomes legitimate to unseat a manifestly flawed ruler. Shakespeare’s play may be set in 14th-century England. It remains, however, a timelessly political work. They covered themselves in glory five years ago with Hamlet; now David Tennant and Gregory Doran join forces again for this lucid and gripping account of Richard II. Having played the most intellectually searching of Shakespeare’s protagonists, who is painfully miscast as a revenge hero, Tennant - in splendid form here - trains his talents on the most self-absorbed and inward-looking of the Bard’s monarchs, who is fatally miscast as God’s anointed deputy on earth. In his gorgeous, gold-embroidered robes (and long, flowing hair extensions, to boot), this Richard is wrapped in the mystique of medieval majesty. But he occupies the Gothic throne with a slouch of disgruntlement, his features congealed in disdain. Admirably resisting any temptation to make the king likeable, Tennant vividly exudes the bored irritability that erupts in tyrannical caprice. And impatience is making him reckless, too. In this production, he brazenly hears the dispute between Bolingbroke and Mowbray at the (interpolated) ceremonial lying-in-state of the Duke of Gloucester, whose murky murder (and, implicitly) Richard’s involvement in it) is itself the bone of contention. But the Richard is a Monarch who would always choose theatrical effect over political prudence. With his great gift for playfulness, Tennant runs heavily sarcastic rings round his usurper in the deposition scene. Holding the crown at arm’s length, and with his back to the assembled company, he calls out “Here cousin”, in the tones of someone inviting a dog to play fetch. This is not a Richard who luxuriates in the lyricism of grief. Tennant delivers the plaintive, self-pitying arias with a scathing irony for the most part, flecked by tiny surrender to abject panic - as though he were at once sufferer and observer of the tragic process whereby, when the royal persona shatters, it exposes the naked, insecure person underneath. By contrast, Nigel Lindsay’s Bolingbroke presents himself as a plain-speaking bloke who has returned from exile solely to claim his rightful inheritance - though there’s a suggestion on his hooded watchfulness and the brutality with which he dispatches Richard’s flatterers that he has a devious, long-term strategy. He plays his cards close to his chest and is embarrassed by Richard, whose upstaging antics leave him having to force face-saving laughter in front of his followers. Interestingly, though, Doran is more interested in the king’s relationship with his other cousin, the young Aumerle. I should perhaps issue a spoiler alert for the rest of the paragraph. This production gives the pair a charged, private sequence on the walls of Flint Castle (evoked by the mobile gantry that slices across Stephen Brimson Lewis’s excellent design). The monarch’s speech of speculative capitulation (“What must the King do now? Must her submit?) reduces his devoted number one supporter to such heartfelt, quiet tears that Tennant’s Richard to touched to a moment of rare compassion for another creature - treating his cousin to a tenderly passionate kiss and a cradling on his breast. But Aumerle, whose riven emotional state is beautifully conveyed by Oliver Rix, turns into the production’s most extreme casualty of the world of divided loyalties. Shopped to the new king by his own father for his treacherous plots, to what desperate lengths might such a man go to prove that he’s been born again politically? There isn’t a weak link in the cast. Ferocious eloquence overcomes deathbed infirmity in Michael Pennington’s superb portrayal of John of Gaunt and Oliver Ford Davies gives a fine edge of grumpy comedy to the Duke of York’s conscience-stricken dithering. Another palpable hit for the Tennant/Doran collaboration. He hasn’t got a clue, has he? You can see from the moment David Tennant’s Richard II arrives on stage with his chin up, his hair Timotei-long, his robes and his diction refined to the point of self-parody. This takes a moment to adjust to. So regularly do we root for Tennant as the heroic outsider, whether in Doctor Who or Broadchurch or even in his SC Hamlet, that it’s odd to see him back a losing horse. When he descends from the ceiling on a golden throne, the gap couldn’t be clearer between his notion of himself as a God-given ruler and our notion of him as a bit of a berk. Not that Tennant’s performance or Gregory Doran’s RSC production turn out to be cartoonist. One of the hottest tickets of the year long before it opened, this is a clear, propulsive, absorbing three hours of a history play that is no cinch to stage. After all, it’s in verse. It has no battles. At the first sign of uprising, the bellyaching Richard pretty much deposes himself(“let’s talk of graves, of worms, of epitaphs…”). “Richard II is not an action-packed drama” understates the introduction to the Penguin edition of the pay. Here, thought, it grips, aided by Paul Englishby’s beautiful period music and Stephen Brimson Lewis’s spare, gilded sets. And what Tennant does brilliantly, is to suggest a man who feels as hollow as his crown. Who play acts at being himself. Who makes bad judgements, such as expelling his cousin Bolingbroke, soon to become Henry IV, that are a weak man’s idea of being strong. He is hiding his true sexuality too, to judge by his long kiss with his cousin, Oliver Rix’s Aumerle. And when he is trounced by Nigel Lindsay’s stocky, gym-teacher-like Bolingbroke, he goes from ruler to martyr. He proffers the crown as if holding out a stick to a dog (“Here, cousin!”). It’s electrifying. We don’t love him, but we get his grief in a play suffused with a sense of loss. Jane Lapotaire’s Duchess of Gloucester mourns her husband and Michael Pennington’s John of Gaunt mourns what Richard has done to England in anguished moments that are both magnificent and a bit hard to absorb so early on. By the second half, though, Doran’s production can sell everything from with to desolation. Near the end, the Yorks, played by Oliver ford Davies and Marty Cruickshank, row about his turning in their son, Aumerle, as a traitor. It’s pretty funny. It’s also a resonant reminder of how the power play and posturing of politics is no job for amateurs. Five years on from his electrifying Hamlet, David Tennant returns to the Royal Shakespeare Company to play Richard II. From the moment of its announcement this has been one of the year’s hottest tickets. Tennant does not disappoint. He delivers a vivid, intelligent performance, at least as mesmerising as the best of his TV work. He is certainly not afraid to make Richard dislikable. Instead of the poetic soul we tend to see, his Richard is irritable. In the early scenes he is petulant and smug. With fluting voice and waist-length hair (Tennant sports mighty extensions) he is a picture of prissy narcissism. And he skips around the stage like a child who has had too many sweets. From the outset Tennant’s Richard is excitingly unpredictable and as his authority crumbles he transforms intriguingly from a gilded tyrant into a more vulnerable character - yet one who is capable of bursts of aggression. By the end he is a holy man in a flowing white robe. Gregory Doran’s production moves slowly for the first hour or so but it is satisfying both visually ad dramatically. It also benefits from the strongest RSC cast in a long time. Tennant’s Richard contrasts nicely from Nigel Lindsay’s robust, manly Bolingbroke. Michael Pennington makes a poignantly eloquent John of Gaunt, while Jane Lapotaire and Marty Cruickshank bring real substance to lesser roles. Oliver ford Davies deserves a special mention: his Duke of York is an unalloyed delight. Doran places an unusual emphasis on the king’s cousin Aumerle (Olive Rix) and it is Richard’s relationship with him- coloured by awkward lust - that defines the production. This is a clear, detailed and dynamic account of a drama that can often seem gutted with artful rhetoric and ceremonial formality. It is an impressive start to Doran’s campaign to stage all Shakespeare’s plays. Five year after his spellbinding Hamlet, David Tennant is back at the RSC and reunited with director (now artistic director) Gregory Doran for Richard II. Last time round there was a lot of hoo-ha about doctor Who and a box-office frenzy. Maybe there’ll be more of that again, with Tennant joining Matt smith for the 50th anniversary special next month. But for the moment, a calm air of focus prevails; Tennant, 42, is in his natural element - and day tickets are available. His hair takes some getting used to: great gingery-brown extensions trail girlishly downwards. Long, magisterial, quasi-medieval robes add to the effeminate impression. In Act III, at flint Castle, beset by ruin, this Richard leans close and kisses his cousin Aumerle (the youthful, boyish Oliver Rix) on the lips. As with Hamlet, so with Richard - there’s an identity crisis at play (“remember who you are”, Aumerle counsels, as if that possible), but here it’s of a sexual nature too. And in a further directorial flourish, Doran makes Aumerle the last face the imprisoned, ousted monarch sees, plunging the dagger into him. Overall, though, this production is more relevant than radical. Doran has suggested he will work slowly, steadily through the canon - and the first scene especially, in which Nigel Lindsay’s tough, gruff, almost too-solid Bolingbroke squares up to Antony Byrne’s aggrieved Mowbray - each accusing the other of treason - feels slow and steady to a fault. Richard’s reign, some 20 years in at this stage (1398), was in severe trouble. Thanks to an emphasised aura of restraint - signalled by a stark, simple set from Stephen Brimson Lewis, augmented by subtle projections on towering screens - you don’t get much sense of the hurly-burly of this chapter of history or of events spinning wildly out of the king’s weakening control. With his startled eyes and concentrated frown, Tennant is frail, pale and consistently interesting but the nervous energy he excels in is confined to quarters early on. Trumpets sound, sopranos trill sacred music as if wafting incense; the king is embalmed in ceremony, cloaked in remoteness. It’s the older hands who galvanise proceedings with emotional intensity in the first half. A quivering Jane Lapotaire as the widowed Duchess of Gloucester, spilling over with unconfined grief, that perpetually stooped, hangdog actor Oliver Ford Davies as the fretful Duke of York and Michael Pennington, little short of magnificent as John of Gaunt - lending febrile and ferocious emphasis to his “This sceptr’d isle” speech and to those last-gasp accusations against Richard. The evening is always lucid but only truly crystallises as things fall apart. Richard spasms with panic as he grasps the frailty of existence, crawling on the floor in abjection. He’s appealingly sardonic as he bows in exaggeration before his usurper, and at the end, having taken on the aspect of Christ, he appears aloft on a gantry, looking down in beatific accusation as Bolingbroke contemplates the blood on his hands. Tennant shines, but he has shone brighter. It has been promoted as David Tennant’s Richard II. All credit to Tennant that it is not, he is too good an actor to be a dominating star. He is elusive, as this self-regarding, self-defeating king should be. He is sardonic, light-footed, unpleasant, alluring, completely free of ingratiation and, by the way, not Scots. He is a primary but not the only strand in the rousing triumph of Gregory Doran’s staging, his first Shakespeare production since becoming the RSC’s artistic director. Doran fires both barrels of Shakespeare’s gun, the tragic and the historical. Tennant’s mercurial clarity is vital to the play’s slippery centre, the melancholy reflectiveness and evocation of royal uncertainty that makes it look like and early shot at Hamlet. He begins preening, skewed on the throne at an angle to everyone. In a court full of bristling near-baldies, he has unnerving long Jesus tresses that he flicks over his shoulders. He becomes skittish, teasing a favourite by placing the crown on his head. He glimmers with white-faced intensity in his dark cell. He is will-o’-the-wisp. Yet this is also a robust dissection of a corrupt England, an examination of dynasty and decay. It bristles wit lickspittles and asset-strippers, with placemen who are ripping off the state’s assets. A fine, restrained Michael Pennington gives desperate dignity to John of Gaunt’s lush - sceptred isle and silver sea - lament for England. The minute the old chap gives up the ghost, minions scamper to grab his coffers and lug them across the stage. The play’s long reach and political urgency are projected forcefully in a production that draws on Stratford’s traditional strengths. It should be able to pass without comment that Shakespeare is delivered at the RSC with ease, lucidity and rhythm. Well, it has not always been so. Here, though there are no dud speakers, Emma Hamilton brings a lovely grace to the small, beguiling part of Richard’s wife. As the Duke of York, Oliver Ford Davies is radiantly authentic. He delivers many speeches as if he were quietly arguing with himself and the audience were eavesdropping. When he erupts into violent confrontation he is shattering. The erosion of the difference between soliloquy and speech is surely one mark of a great Shakespearean actor. The bustle and business of a court is enjoyably present in a production that features wimples, trumpets and armour, some fairly camp singing and a few ranty bits round the edges: would Nigel Lindsey's terrifyingly brusque Bolingbroke really win hearts to become the people’s king? Yet just when you think it is wholly traditional an extraordinary twist appears. The text has been tweaked to accommodate an unexpected homosexual kiss, and an unexpected (that’s to say, rewritten) murderer of the king. Both are provocative and both make sense. As does Stephen Brimson Lewis’s design. It swims from one semi-abstract CGI grey sketch to another, suggesting that the gaudy business of royalty, the difficulty of a man trying to work out who he is, takes place in a world of indifference. It is becoming and inadvertent tradition that Royal Shakespeare Company supremos set the seal on their appointment by directing all eight Wars of the Roses histories. 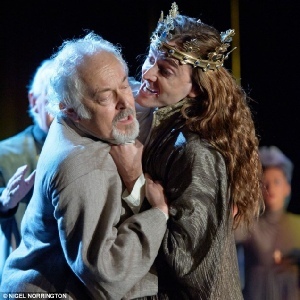 Gregory Doran’s cycle may be disguised within the company’s six-year programme to stage every Shakespeare play, but it is nonetheless, and gets off to an attention-grabbing start with David Tennant in the title role of Richard II. It is an excellently clear production. National Theatre chief Nicholas Hytner, who has remarked that even he takes 10-15 minutes to tune into a Shakespeare drama, would have no problem with thus opening-scene presentation of two courtiers accusing each other of treason and Richard failing to arbitrate. Tennant, however, strikes and unexpected figure on his first appearance: in flowing robes, with hair halfway down his back and an unusually precise accent, he seems rather like King Elrond. But this is the starting point of a journey to prime Tennant territory. This Richard is at first casually heartless, light in manner but not in his conduct; then, the moment that Henry Bolingbroke’s revolt appears to have a chance of success, Richard’s inner house of cards instantly collapses and he begins to speak “fondly, like a frantic man” - that is, he raves with paranoid, self-pitying bitterness. (Elvish has left the building.) This Richard does not cow Bolingbroke with dense musings on divine right; he gibbers petulantly, not even attaining true magic grandeur during his final imprisonment. Tennant’s gift is to unravel such knots of language. The rest of the principal cast is correspondingly heavyweight. Nigel Lindsay’s Bolingbroke (who becomes Henry IV) is a dignified bruiser; early on, Michael Pennington as John of Gaunt and Jane Lapotaire as the Duchess of Gloucester give a masterclass in history play-acting, and Oliver Ford Davies as the Duke of York is consummate throughout as showing us every detail of character and language alike. Stephen Brimson Lewis’s set design is a little excessive: at different points Richard is flown in on a castle rampart and emerges from a dungeon trapdoor virtually the full size of the RSC stage. But this does not get in the way of Doran’s staging, which even injects a note of homoeroticism rendered poignant by a subsequent treachery. It is all more than enough to dispel any jaded seen-it-all-before sensation regarding the histories to come.